We had a wonderful day at Longleat singing 'The Frog Chorus' with Lee Mead, Hayley Westenra, Claire Teal, Red Hurley and hundreds of TOGS (Terry Wogans Old Geezers). The song was recorded for Children in Need and is one of the tracks on the Bandaged Together Album. 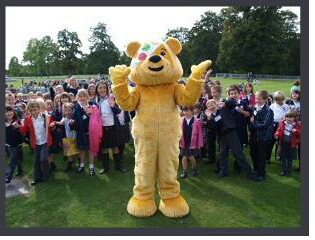 All the proceeds of which all go to Children in Need! Click here to see the photo album from the day's events and find out more about the Bandaged Together album. Click here to read about us in the Wiltshire Times.